The Painted Hall is part of the Old Royal Naval College in Greenwich, originally designed by Sir Christopher Wren in 1696. Following an extensive refurbishment of the Grade I Listed building, undertaken by Hugh Broughton Architects working closely with Martin Ashley Architects, architectural photographer James Brittain has documented the building on behalf of the architects. Below, James shares some of these beautiful photographs and his thoughts on his approach. JB I was very pleased to be asked to make these new pictures showing the conservation and refurbishment of the Painted Hall, since I’d photographed the building fifteen years ago prior to its restoration. The transformation of the main interior is dramatic. 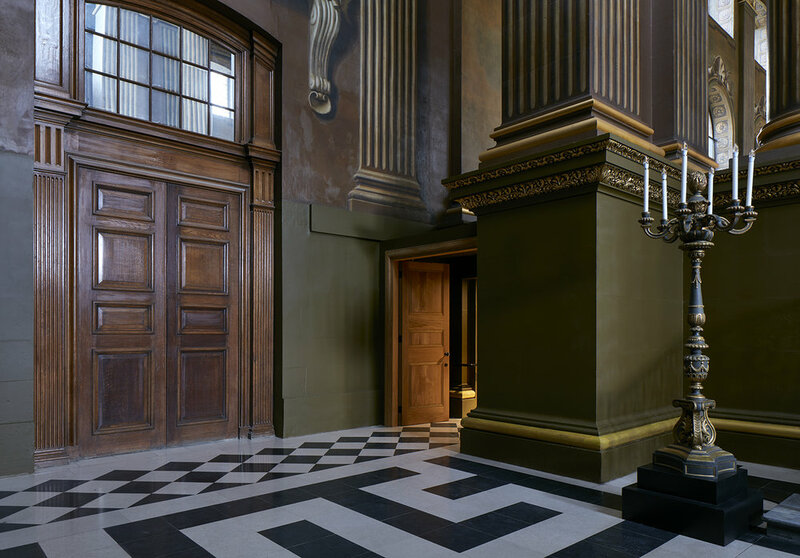 Conservation work to James Thornhill’s eighteenth century ceiling and west wall frescos has brought out the depth and beauty of his original paintings – further enhanced by new lighting installed under the direction of Hugh Broughton Architects. One of the key considerations for photography in the Hall is the level of natural daylight falling into the interior. On my early visits in 2003, it was particularly challenging to reveal the ceiling fresco in photographs, due to an imbalance in the relationship between natural light from Wren’s tall windows and the installed interior lighting. This was further complicated by reflective varnish on the painted ceiling surface, which caused flare in the camera lens. My solution back then was to install a large 8-foot tall black painted box around my film camera to reduce the glare. This time, the technical constraints were less troublesome. Neutral density filtration to the windows, conservation to the painted surface itself and sensitive new lighting freed me to pay more careful attention to the fall of light, and the feeling and atmosphere of being in the space. I’m fascinated by the notion of revisiting architecture, and how places change and are adapted over time. In the Undercroft, the footings of the original Elizabethan palace beneath Wren’s building have been exposed. 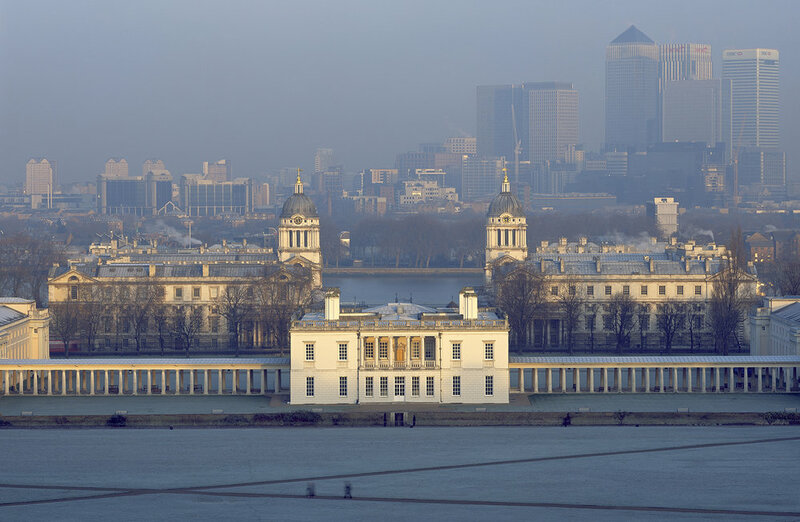 The Hall was originally used by the Naval College for banquets and events, and furnished with long dining tables, leather backed chairs and candelabres. Today the grand tables have gone and the room has simple benches. The new arrangement is more contemplative and serene. Further information on the refurbishment can be found on the Hugh Broughton Architects website.